The LA Auto Show, November 19-28 2010, is an annual auto show held at the Los Angeles Convention Center. Every year the LA Auto Show kicks off with two press days full of activity for journalists, designers and industry representatives alike. Each year for the past seven years, a topical theme is chosen and the major Southern California automotive design studios are invited to compete in the Design Challenge. For the first time studios from Germany and Japan will join the competition adding an international dimension to the contest. The highly anticipated challenge allows studios to flex their creativity and explore new ideas in automotive design. The theme this year addresses society’s shift toward minimizing consumption of the earth’s resources. The objective is to envision an efficient, light-weight, four passenger vehicle (not to exceed 1,000 lbs. ), that is both comfortable and safe, while delivering satisfactory driving performance without sacrificing the styling consumers demand. Infused with Nissan’s heritage of sports and performance, Nissan iV is a high-performance EV inspired by nature’s intelligent beauty and crafted by human ingenuity. The iV is a super-lightweight sports tourer that showcases “organic synthetics,” a revolutionary manufacturing technique in which automotive parts are cultivated like agriculture in a 100% sustainable, carbon-neutral process. Less is more. Every detail of the Nissan iV is engineered toward renewable, lightweight strength and maximum efficiency. Featuring an interwoven organic frame, iV’s chassis material is synthetically grown and formed into a stunning, aerodynamic shape. Derived from fast-growing ivy and re-enforced with spider silk composite, the biopolymer frame is flexible and ultra-light, yet extremely robust. The spacious, panoramic cabin comfortably seats four adults and is constructed from an innovative photovoltaic material that weighs 99% less than traditional glass. While the canopy collects solar energy, it also provides protective safety and unique, open-air views of the outdoors. Underneath it all, a slim bio-battery provides stability and a near limit-less range made possible by regenerative super-capacitor technology that recoups 60% of kinetic energy spent. 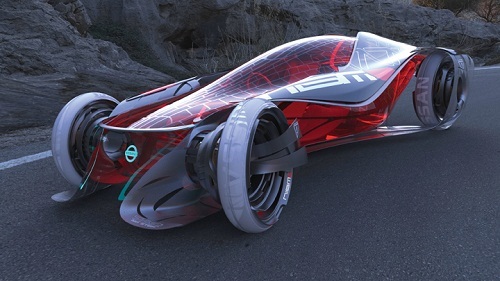 Nissan’s patented concentric hub-less in-wheel motors not only propel iV, they do triple-duty by functioning as the vehicle’s steering as well as its suspension system, via magnetic levitation and propulsion. Concentric magnetic rings amplify rotation with each outer ring to boost high-speed performance and provide independent wheel control for ultimate handling and maneuverability. Inspired by schools of fish and their fluid movement, Nissan’s pro-active Safety Shield™ renders collisions a thing of the past and reduces weight by eliminating the need for heavy structures (bumpers, beams, airbags, etc.). Through industry-leading technology, Nissan iV maximizes the driving experience by eliminating excess. Nissan fulfills a deep nostalgia for the joy of driving with a strikingly beautiful EV that can deliver electrifying, agile performance with zero-guilt.